For the better part of 2009, we here at CCP have been formulating new strategies to address the issue that all persistent services on the Internet ultimately face, i.e. the data persisted in our systems has meaning to people and everything that has meaning has value. Frankly speaking this has been something that we have been strategizing about since 2004. Even though we have throughout the years kept the Real Money Trading element at bay with manual actions from our game masters, we have always realized that this is a bigger issue that needs to be addressed with innovation and thoughtfulness. As early as 2005, we came up with the seed which was later released in November 2008 as the Pilot's License Extension(PLEX). It has had many names through the years such as 28days and CCP Points, and it has been refined and iterated to the point that it is accepted by you, our players, as something that adds value to EVE and that is something we care deeply about. So our solution is based on two vectors; managing the demand for ISK and addressing the supply of "illegal ISK." In my previous blog I had mentioned PLEX and how that creates an official channel that keeps the value within the EVE ecosystem. Now it's time to talk about the "Unholy Rage." The name might sound dramatic to you, but it is representative of the sentiment that many here at CCP feel towards the RMT element which we feel is exploiting our game (in the original French meaning of the word). We feel violated, but we still understand that we must address this in the manner of the FDIC not the SWAT. Based on our new strategy and methodological process, CCP was finally prepared for a major offensive against the Real Money Trading (RMT) element in EVE Online. Codenamed "Unholy Rage," the operation was launched on June 22nd and is still ongoing. Previously, we had done some test runs to tune our systems, notably with the launch of Apocrypha in early March when we banned around 3,000 RMT type accounts. A lot of wisdom was gained from the tests we had done, and planning and preparations for another large-scale FDIC (Federal Deposit Insurance Corporation) style action went full steam ahead. In the weeks and months building up to June 22nd we monitored and analyzed activity of ISK sellers, and in particular, their supporting groups of macro-miners, ratters, mission farmers and other RMT related units. The information obtained by this research was then used to identify further RMT type accounts and to prepare lists to process in the action. The preparations also included identifying various items of interest that we wanted to monitor and measure, such as market activity, server performance, petition trends and so on, as our intent was to examine the effects of the action in a scientific way and in as much detail as possible. Finally, a lot of work was put into gathering information on and collecting lists of RMT type accounts to be targeted in the operation. During scheduled downtime on June 22nd a little over 6200 paying accounts were banned in one go. Now, that is a beautiful graph if I ever saw one. 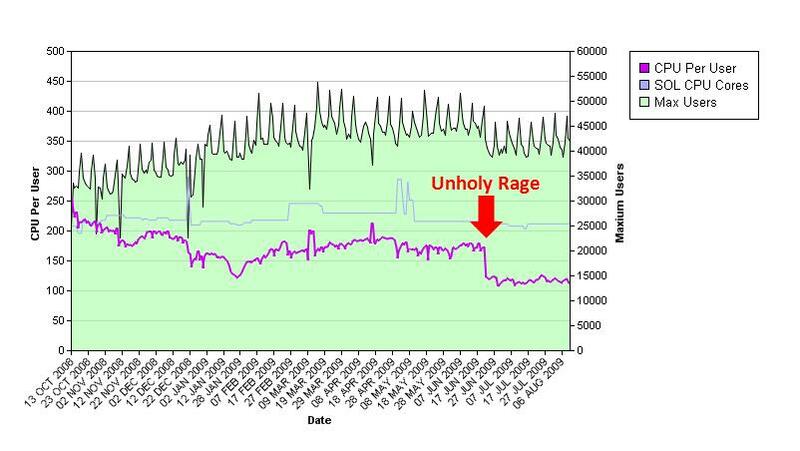 Check out that purple line representing average CPU Per User. This clearly shows the very disproportionate load the RMT type accounts imposed on our system. While the number of accounts banned in the opening phase of the operation constituted around 2% of the total active registered accounts, the CPU per user usage was cut by a good 30%. That is a whole lot of CPU for the rest of you to play with, people. 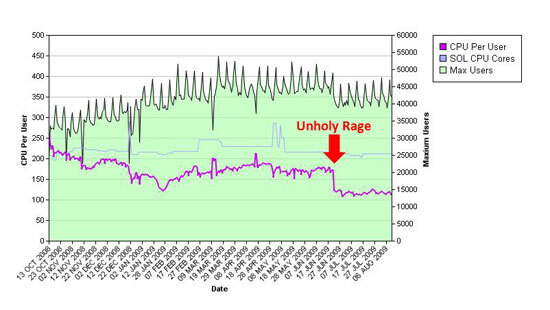 Load issues for certain solar systems that were hubs for RMT activity have also dramatically altered. Anyone who has travelled to Ingunn in the past can testify that this particular solar system was well clogged up with haulers and shuttles running missions pretty much 23/7. Here's a little graph showing the population in Ingunn before and after June 22nd. Clearly, the state of Ingunn has improved so dramatically that one can hardly recognize it as the same system. The same is true for many other systems previously chock full of macro miners and mission farmers. Another great improvement is that space is now suddenly full of belts of oversized asteroids that were previously sucked up by hoards of macro miners of the RMT persuasion. Regular players are now starting to see mining as a viable means of making some ISK and they are moving in to take over the business. One of the main focus of our monitoring is the effect this operation has had on the in-game market. As we expected, prices of Attribute Enhancement Implants were immediately affected by the bans. A good example of this is the Memory Augmentation - Standard implant. 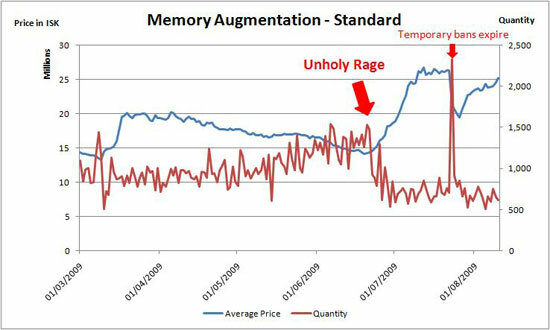 Immediately after the launch of Unholy Rage the average price (blue line) went up by nearly 100% and the quantity (red line) went down considerably. The spike there in quantity and the drop in price happened when RMT accounts that had been temporarily banned for research purposes became active again and flooded the market with implants they had stashed away. A permanent ban was quickly applied to all the accounts as it was quite clear that they would be returning to their old ways. Aside from a few implants, the in-game market has been remarkably unaffected by all this. We have closely followed the total number of daily market transactions and total amount of ISK traded per day. As can be seen above those numbers have gone down by only around 10% overall. In the weeks that have passed since June 22nd, we have continued to remove new RMT type accounts as they have been identified. The war against the RMT element continues. We strive towards driving their operating costs to unsustainable levels. Our objective is to get rid of them, plain and simple. They are a heinous nuisance and a serious drawback on our systems and resources. Credit card fraud and account hacking is their game - the recent hacking troubles have been the work of the ISK sellers. They must be driven out and kept out. This will not be possible without help from you, the players. The demand for ISK is what keeps the RMT element alive. They'll keep coming back as long as players are willing to do business with them. We realize that the demand for ISK will not go away and we offer an alternative. The alternative I speak of is, of course, PLEX. The benefits of PLEX are enormous. Your money is channeled into making EVE greater rather than ruining it. Players are able to pay for their subscription that otherwise would not be able to play. It's win-win people! Just say NO to RMT ISK.